I have a 2004 Silverado 5.3 L it will do everything you can ask, I have pulled a 17' open trailer all over the country with my 26 coupe or 24 Fordor, I have never had an issue. In a pinch I've pulled small dozers on a 16 ft trailer with a 2006 Chev powered by a 4.3 V-6 with an automatic. Thats maybe 3 times the weight of your "T" and Probably a bit beyond the upper range of its towing capabilities, but as long as I stayed away from the AC and ran the heater at full blast with the windows open for extra cooling on long hills, it handled it without a hitch. My 2003 Ford F 150 (4.2 liter/302 cu.in.) was brand new when I towed a 7000 lb. oil field engine from West Virgina back home to California. What's that got to do with your Chevy? Only that a half ton pick up will tow a lot more safely than you realize, so check your owner's manual for tow weights. Suggestion: equip at least one trailer axle with electric braking. It IS worth it! Should be fine. Maybe consider load levelers if you haven't got them. I towed all over the western and midwest with a 2006 Silverado with the 5.3 engine. 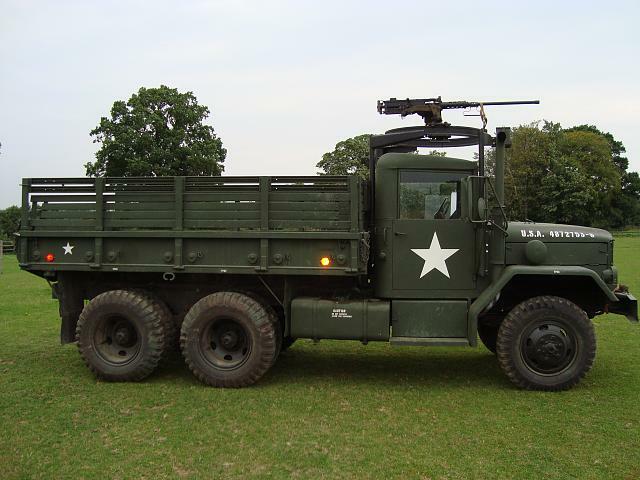 Often had a camper on the back in addition to a T on a flatbed trailer. No problems at all with the truck. I did have a electric brakes on the trailer and feel they are necessary if the PU is running relatively empty. The one thing to be a little careful about, is that a half ton pickup (I believe most Silverados are pickups) are a bit light on the rear end. Don't push your luck with speeding, or heavy braking, especially on curves. The rear tires can break loose and jackknife with the trailer. Just like driving a model T, a little extra attention and planning up front is all that is needed. Some people using half ton pickups put something heavy on the back end of the pickup bed to help with rear traction. (I have known people that kept bags of cement or other weights next to where they kept the truck. One fellow I met years ago had a couple junk model T engine blocks he used. 150 pounds just inside the tailgate can make a big difference. The full bodied SUV on pickup chassis have just enough more weight on the back end that they don't have much trouble that way (wind resistance actually improves rear wheel traction a lot for full-bodied SUVs, by pushing the weight distribution farther back at higher speeds when it is most needed). Putting a shell on the back of your pickup will help some (although a shell does weigh less than the full body does, you do gain the wind resistance weight shifting). I used to pull a 23 foot camping trailer with a small GMC V6 Safari van and automatic transmission. Be gentle with the vehicle, don't push it going uphill, manually select lower gears much of the time instead of allowing the auto-trans to shift up as soon as it wants to. And you can tow over-size loads for many thousands of miles in reasonable safety, and little extra wear and tear on the tow vehicle. The only problem resulting on that Safari van from that towing, was the rear tires (radials) were over-torqued under load causing the inner casings to tear and both rear tires became egg shaped after a couple years of using it that way. The van started shaking and bouncing. I suspected what the problem was (I knew those lousy tires weren't up to pulling that much weight), took the wheels and tires off the van and rolled them on a smooth sidewalk. The egg shaping was clearly visible just looking at the top side of the tire, while rolling it. 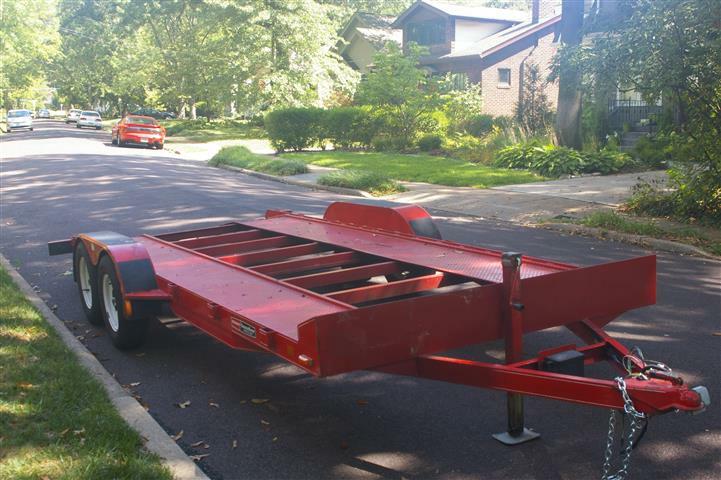 Below is the trailer that I own. I have pulled it with my 89 C2500 or my son's 88 K1500. We have pulled Model T's through a 2010 stretched Ford Super Duty. Believe me, when you get a car hauler you get a lot of requests to haul other people's cars. Just make sure you have good brakes on that trailer. How often and how far, and does your truck have the four button drivers info switch above the headlamp dimmer switch. If not you can buy the panel with the switch for about $100.00, with this you can monitor thinks like the transmission oil temperature and the tire pressure. I had a 08 extended cab 5.5ft. box with 3.73 ratio axles. You should check with the dealer parts dept, the can give you a printed parts breakdown. The 08 was a little anemic pulling a camper at highway speeds on grades. 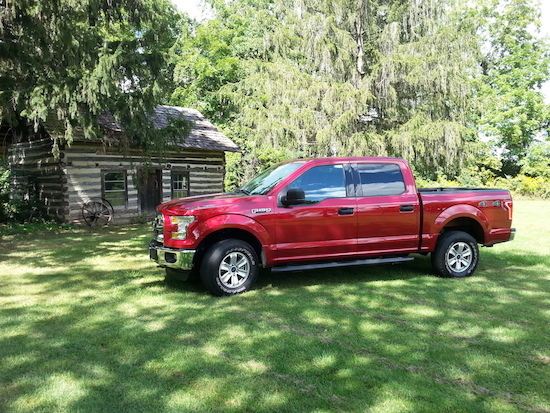 I know have a 2013 same truck with a six speed but 3.42 ratio will wait to see how that works this summer. I like the six speed better during midrange acceleration. Use the tow haul switch and watch transmission temp. Yes, load equalizers of the sway control type and load the trailer with at least 15% of the weight on the hitch. Make sure the trailer has brakes, and if the truck does not have built in brake controller, buy the inertia type, NOT THE TIME BASED KIND!. I pull a 16 foot closed trailer with my 2008 Suburban with no problem. Tongue weight is very important and can address the issue Wayne raises about rear traction. I have also pulled the same trailer with an older shorter wheel base Tahoe and it does well too but the ride is rougher. Load leveling and anti sway devices are also well worth the cost. I am assuming your trailer has brakes but if it doesn't that is a whole other issue. I would not use a trailer without them to move a car. I haul 5000 lb tractors with my 18' and 2000 Chevy with a 5.3, and have no problems. What does the door jam tag / owners manual say ? IF you are in a wreck, the law and your insurance company will REALLY care about this!!! I'm driving a 2012 GMC Sierra 1500 with 4.8 V8 and four speed automatic, and use it all the time as a tow vehicle...I've got a 16' tandem axle open car hauler with a GVW of 7500#, and I've had no trouble hauling trucks, tractors, and tree-length firewood with just a frame mounted (not bumper) hitch, electric brakes, and load equalizing hitch. If your truck is the standard cab short box/SWB I would have some concerns about stability towing with a shorter wheelbase than the standard variety in less than ideal towing conditions (bad roads, slippery, winds, etc). The only way to know for sure if it works is to try it. If the vehicle doesn't have a transmission cooler on it, I would get the largest one available and have it installed. A cool transmission is a happy transmission. I pull with my 04 Sierra with a 5.3 no problems at all. Longest tow was pulling the drift car from Massachusetts to Wisconsin and back. The truck didn't flinch. This puppy with a supercharged 302 doesn't even know my 8.5x20 enclosed trailer with a car in it is back there. These all factor into an informed choice of tow vehicle. As I grow older - I am becoming even more wary when I climb in the cab of my truck each day. What matters is arriving alive - with your load intact - with other drivers you share the road with in the same condition. It's whats up front that counts!! Bud in Wheeler,Mi. Afraid not. It's what's on bottom that counts more. I pulled a 20' HD trailer with a dozer using a C10 with a 305 2-bbl. Going wasn't a problem. Stopping was. Our 06 tahoe with a 5.3 will pull and handle my 16ft enclosed v-nose trailer but keeping up with traffic on the interstate in the hills beats the snot out of the 5.3 IMO. My 05 HD 2500 with the 6.0 is more at home pulling it. Depends on how often and how far as said before. Trailer brakes at least is a must. Back to the trailer what are it's specs. I've traveled extensively in the lower 48 with this rig. I have electric brakes on all four trailer wheels. The Jeep has an 8 cylinder engine. If your tow vehicle and trailer are not up to specs, and there is an accident, the "billboard lawyers" will eat you alive, then take all of your assets, whether you are at fault or not. Gentlemen: Thank you for all of the great responses. The advice from experienced individuals like you is without equal and much appreciated. To answer a few question: my Chevrolet is a short wheel base single cab with 6 1/2 foot bed. It is a Z71 with four wheel drive. It does have the towing package and I just had the electric brake controller installed. The trailer does have electric brakes. And to Bill: I appreciate the legal advice and though I am a lawyer I will be on the lookout for those "billboard lawyers." Thanks guys. If you ever want to get the ultimate in a fuel efficient towing rig, you could go with the new GMC Canyon Duramax Diesel. It has a four cylinder turbo diesel. They greatly out handle a full size truck and come standard with an adjustable trailer brake controller and an selectable exhaust brake so you can go down a long mountain road and never touch your brakes even while towing. Mine gets 17 mpg U.S. while towing double trailers with the car inside. Mileage is in the thirties when not towing. I had nearly that exact setup. 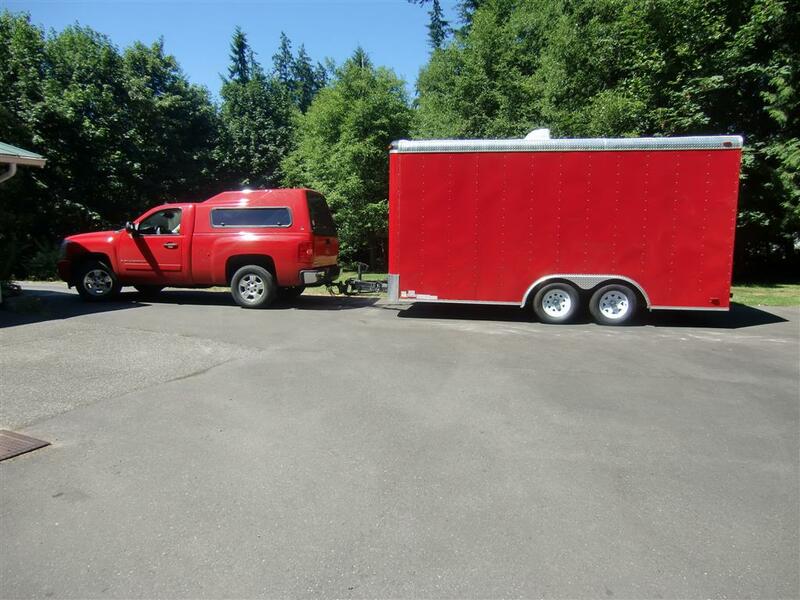 2007 Silverado 1/2 Ton, Short wheelbase, 5.3L engine towing a 16 foot extra height trailer. No issues what so ever. I recently bought a used low mileage 2004 dodge 1500 that has the tow package and 5.7 hemi. It will pass everything but a gas station. But what towing I have done so far,that 345 hp has went above and beyond my expectations. There should be a site related to your brand of truck. My question is,if you bought a 3/4 ton dodge new,why would you not use it? NO worry's with that much hp and torque.And if it aint up to snuff, it is best to find out before the warranty goes out. Since I made my purchase I am hoping when i get the T pickup finished,and the trailer refurbished,I should be able to haul it to a couple shows and such. I had a 2004 gmc 1/2 ton 5.3 50,000 miles that we were going to take to Florida with a 7000 lb travel trailer. Two weeks before we left the electronic equipment went crazy. I bought a new 2018 gmc 1/2 ton 5.3. It pulled the trailer fine the six speed transmission worked great. The brake control is built into the truck. I get between 9 and 10 mpg. My research before buying the truck was the tires are P265 I was told the P meant passenger tires and had weak sidewalls for towing. I had the dealer change the tires to LT light truck tires. They refused to change them but as I was walking out the door they change their mind. Check with a good tire dealer, not Walmart. Your trailer must have brakes on all four wheels, I believe that is the law in all states. I know it is in Ohio. 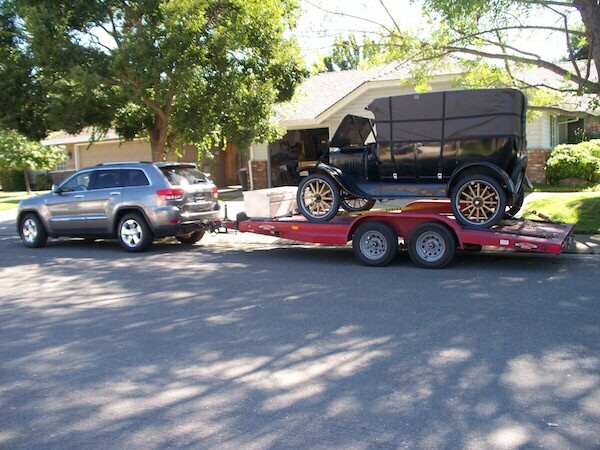 My trailer is like yours, I have hauled model T's, 55 to 1960 cars and tractor with no trouble. Hi Mack and Bill. First I am not planning on buying that Ram pickup 3/4 ton. I was hoping my Chevrolet would do the job instead of paying $72000 for a new 3/4 ton truck.But Mack,if I had it I would certainly use it. Bill, I will check my tires but I believe the tires on my truck are specifically for a truck.This was all great advice guys. Thank you!! !